Croatia is fast emerging as one of Europe’s great value destinations. It is well-connected to other major European capitals through its various international airports on the coast and inland in the capital where Croatia motorhome rental agents are ready to meet you off your flights. Reserve the recreational vehicle perfect for your needs before you travel; so you can just pick up your keys upon arrival and be on your Croatian camping holiday right away. Croatia has everything for everyone: Roman ruins and palaces, miles and miles of Adriatic coast dotted with more than a thousand islands, Italian-fusion cuisine, UNESCO heritage sites and natural wonders, and plenty of sun. With the completion of the Croatian Motorways, well-marked scenic roads, and an increasing number of camping parks located near tourist areas accepting motorhomes, campervans, and recreational vehicles rentals, it’s also becoming a favourite destination for a self drive road trip vacation. The historical coastal city of Dubrovnik on the southernmost tip of the Dalmatian coast has a well-deserved reputation as the Pearl of the Adriatic, and is a fitting introduction to an unforgettable Croatian vacation. Its Old Town and stout City Walls are its main tourist draws. Join one of the walking tours to experience the fictional King’s Landing up close. About four hours up the Dalmatian coast with a Croatia RV rental is Split, an ancient port city that grew around the well-preserved retirement palace of the Roman emperor Diocletian. Whether there are tourists or not; Split is a bustling transport hub for local boats that ferry passengers to and from the islands. Hop on one of the ferries for a day trip to Hvar; which was a trading settlement in Greek and Roman times. Hvar is now a popular stop for car ferries and cruise ships. Once back in Split, you have the option to follow the Croatian coast all the way to Pula in the Istrian peninsula, or drive your Croatia motorhome rental inland via Zadar to the Plitvice Lakes National Park. 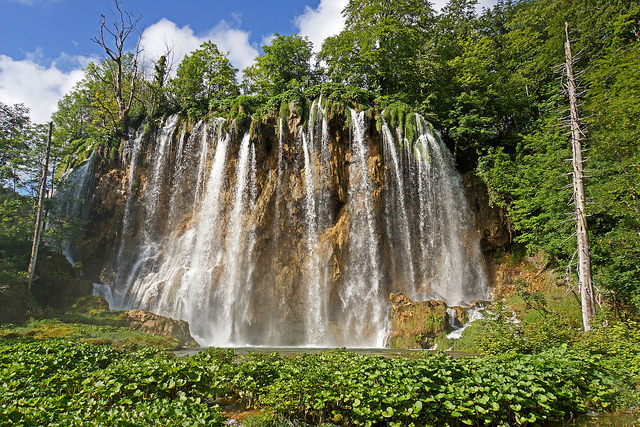 Plitvice National Park is listed as a UNESCO Heritage Site and is renowned for its picturesque interlinked lakes and heavily forested canyons brimming with countless cascades. If you take the coastal route with your motorhome hire in Croatia, make a stop in Rijeka, the principal seaport of Croatia and a gateway to the islands. Make time to explore its city centre teeming with ornate Austro-Hungarian style buildings. Quite fittingly, the motorways start or end in Zagreb, the largest city and capital of Croatia. This is where modern commerce and local life is at its most vibrant, and where you can get the comforts you might expect from a prosperous European capital. With its international airport linked to other major European cities, this is the best place to pick up or drop off one way RV rentals in Croatia. Croatians drive on the right side of the road. Technically, you are required to carry an International Driving Permit. It’s not always asked to be shown, but you can be fined if found driving without one. Speed limit is 50-90-130: 50 km/h in residential areas, 90 km/h in non-residential areas, and 130 km/h on motorways. To reach Dubrovnik from Split, you need to cross a short portion of Bosnia-Herzegovina. This might require a visa or other special entry requirements. Toll fees apply on motorways and may be paid either in Croatian ‘kuna’ or Euro. You should keep your receipts to avoid getting overcharged.